It was longer than he had hoped, but Marty Moore finally made his first competitive appearance for Ulster last weekend in the 24-10 against Leicester Tigers in the Heineken Champions Cup. 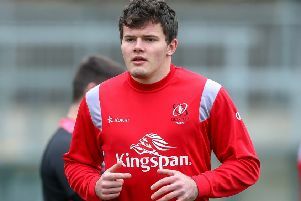 Moore, who joined the Irish Province from Wasps during the summer, played against his former club in a pre-season friendly, but a calf injury has kept him sidelined for the past few weeks. But he made his debut last weekend and here he talks about facing Racing 92 and settling in at Ulster.